There are a number of reasons why the American Dental Association recommends that you go to a routine dental checkup every six months. A primary reason is that during your routine appointments, we are able to screen for cavities, decay, and gum disease, so we can treat any threat of problems, before they get out of hand. On a more severe level, we also screen for oral cancer during routine dental checkups. Oral cancer is a common form of cancer, affecting about 49,670 Americans. It has a variety of risk factors, including: being over the age of 40, smoking, drinking, and frequent sun exposure. While these risk factors exist, oral cancer isn’t isolated to these groups. About 25% of people with oral cancer don’t smoke or drink at all, and oftentimes, most instances of oral cancer go unnoticed, until they have developed into lethal cases. Catching precancerous lesions with routine oral cancer screenings is one of the safest ways to prevent advanced oral cancer. Oral cancer is first detected through a visual examination of your lips, tongue, and the inside of your mouth. During this examination, we are searching for red and white patches, or sores with abnormal appearances. We also might need to press down in certain areas to search for swelling and lumps, as well as move the tongue around for a better view of the inside of your mouth. If we suspect an area might be precancerous, we will use a special light or dye to further investigate. If cancer is suspected, we will recommend a biopsy, in which a small piece of the tissue is extracted for further examination in a laboratory. Whether your lifestyle puts you at risk for oral cancer or not, oral cancer screenings can bring you peace of mind and even save your life. While you can search for signs and symptoms of oral cancer about once a month at home, a professional screening should occur before visible symptoms appear. Visual examinations: For a visual examination of oral cancer, we will need to look at your face, neck, lips, and the inside of your nose and mouth. Before a visual examination for oral cancer, we will first ask you to remove all of your dental appliances, then look for asymmetries, swelling, lumps, color patches, ulcers, or other deformities. To get a clear view of your nose and mouth, we will use a light and mirror. Like a regular physical, we will also use a tongue depressor to assess the back of your mouth. We also might use other tools to look at your gums, cheeks, roof of your mouth, tonsils, and throat. 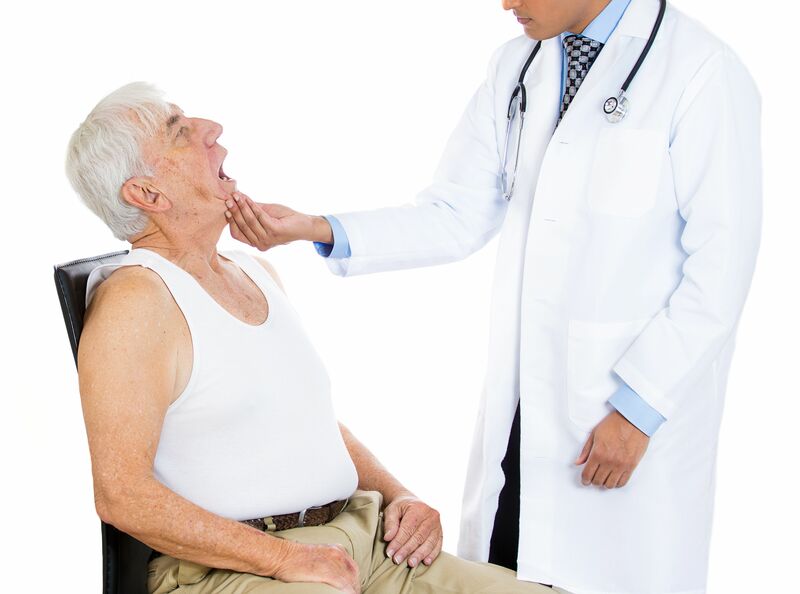 Physical examination: During a physical examination, we will need to physically touch the head, cheeks, jaw, chin, and mouth to feel for masses. If tissue that should be moving remain immobile, this could be a cause of concern, along with any physical discomfort with physical contact. We will also most likely examine your ability to swallow. Some oral cancer symptoms might be painful. However, painless swelling could also be a cause for concern. Oral cancer screening devices: Beyond physical and visual exams, using specialized oral cancer screening devices can help us get a better assessment of the area. One of the most common dental devices we use for oral cancer screenings is called the Oral CDx, which is a painless devices that uses a brush to scrape cells for testing. The VELscope is another frequently used tool, which detects abnormal tissue with a blue light. If you are experiencing any of the above symptoms, you should schedule an appointment with a dentist immediately. Oral cancer screenings are one of the easiest precautionary steps you can take for early cancer detection. Call Cadle Cosmetic Dentistry today for an appointment at 727-312-1300.